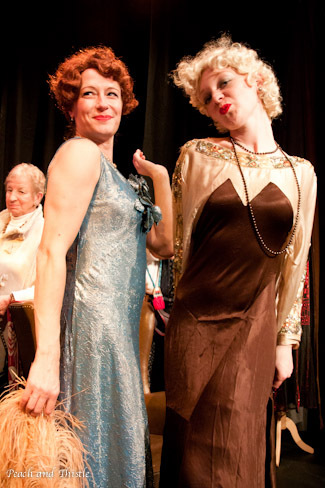 A good friend of mine invited me (and several other friends from our book club) to The History Wardrobe's presentation "Agatha Christie & Art Deco" at the Ilkley Literature Festival. Ilkley is a lovely town about half an hour (17 miles) from Harrogate, and so drew on Harrogate's proud attachment to Ms. Christie (here). I'd not heard of The History Wardrobe before, but when Lexi and I met up in Edinburgh she said it was wonderful- and I trust her opinion, both for taste and for her literary expertise! The performance was October 7- the day before our family was leaving Harrogate. This may have seemed like a stressful time to plan one more thing, but we were living in the holiday apartment, the pets' last vet appointment was the Friday before, and our Monday was going to be busy, but that Sunday? I could think of nothing better than a good show as a last hurrah with a great group of friends. Lucy Adlington and Merry Towne were our hosts through the beginning of the 20th century. Several costume changes showed us both how women's dress evolved and how the different characters in society (and in Ms. Christie's books) would have acted in accordance with their attire- something described in great detail in most of the mysteries. 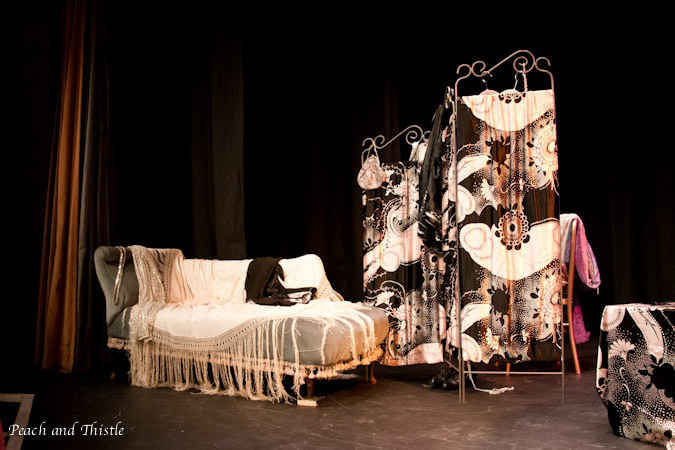 The changing curtain where our characters emerged. Some of the props. 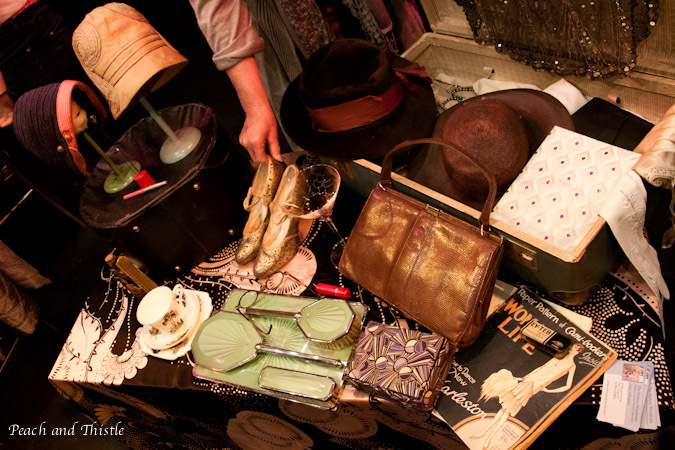 Those cloche hats are back in style now! 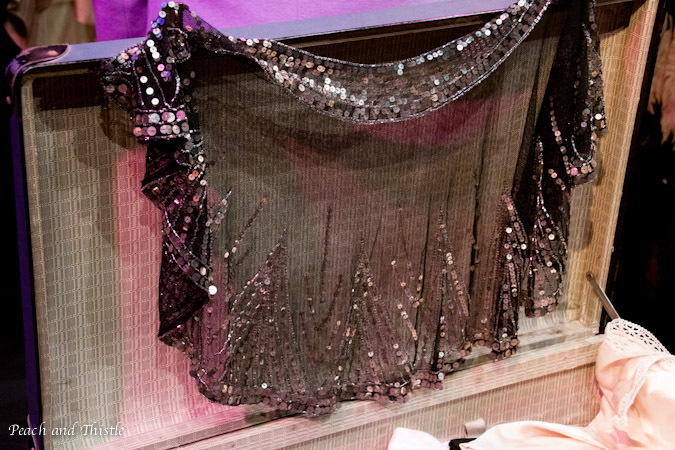 Easily the most popular costume piece- a sequined shawl that sparkled and danced in the stage lights. My pictures do it no justice whatsoever! I'm sure there are literary festivals and other "living history" performances throughout the States- and, with my regret in not having discovered them sooner in England, I plan to seek them out and take full advantage of them! Do you know of any? This sounds really interesting, I've never heard of it. As soon as I read Ilkley all I could think of was "On Ilkley Moor bar t'at (where the ducks play football.)" Hey-ya! I've been hibernating and GOODNESS Me, what changes there are here (and I SUPER love them). 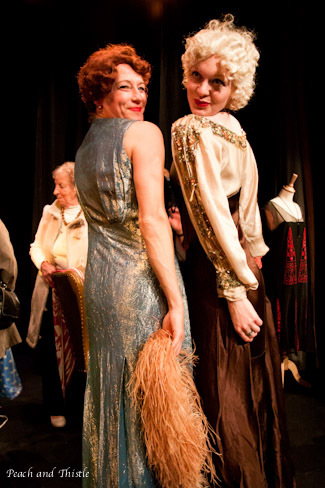 I've been to 2 History Wardrobe events and loved them - this Agatha Christie one and one about the Titanic. So good. Oh hello there, it's me again. Somehow I missed the bit that mentioned me and how I've *already* told you about how much I love the History Wardrobe, which, erm, makes me really embarrassed. Sheesh, you think I'd recognise your own name, wouldn't you! This sounds so interesting. If you do hear of any in the States, fill us in! This sounds fab - I love it!! It makes me want to go there RIGHT NOW! !